signed and on verso titled and inscribed "$35." The 1930s were a time of great creative output for A.J. Casson. The Depression had slowed the flow of work at the commercial art firm Sampson Matthews Limited where Casson worked as a graphic designer, and he was able to devote much of his time to painting, both in the studio and in the countryside. 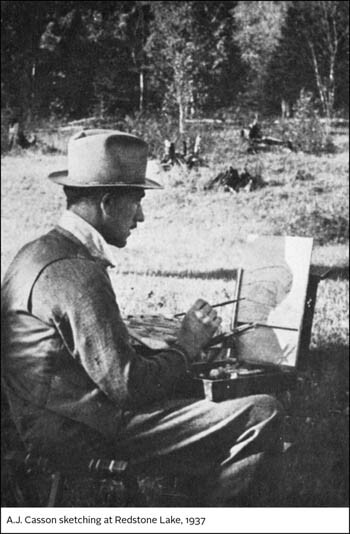 One of Casson's main painting locations in 1937 was Redstone Lake. Paul Duval comments, “In particular, the brilliant series of autumn sketches done...in 1937 around Redstone Lake, hold the potential of superb major landscape paintings. The brilliant technique, glowing colour and strong design of such small panels...typify on-the-spot painting at its most compelling. 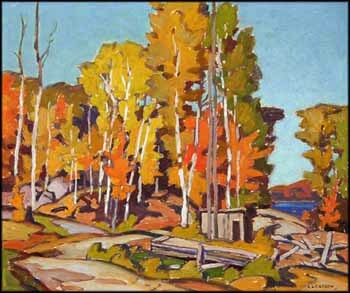 These are not mere notes-by-the-way, but well realized and intensely rendered little paintings, executed by an artist in sure command of his medium and creative powers.” Redstone Lake, with its row of trees in rich autumn colours arrayed against a turquoise sky, and its small cabin and view of the deep cobalt lake through the trees, is a superb Casson sketch. In the late 1930s, Casson was exhibiting internationally as well as in Canada; in London, England his work was in the Coronation Exhibition in 1937 and in a show at the Tate Gallery. In the United States, he participated in the Great Lakes Exhibition in 1938 and in the 1939 World’s Fair. Included with this lot is the Sclater Shield Cup from the 1948 tournament and a photocopy of a letter from Casson dated February 18, 1976, regarding this painting. Casson wrote, "I have not been to Redstone Lake for some years now. At the time I painted your sketch the lake was a wilderness, but now it is filled with cottages and all that goes with them."